The English man, Ian Knowles spat out the words in a loud voice. Then punctuated his outburst by stabbing his hunting knife into the huge sawed off tree trunk that served as a table. His thrust was so hard it buried half the eight inch blade. The rest of it vibrated back and forth like a turning fork. Only it didn’t make a sound. The only noise in the make shift lean too came from the howl of the wind and the sound of snow pellets hitting against its sides and roof. There was a fierce blizzard outside and it was snowing, but not the normal soft, fluffy flakes. Instead, the snow was more like hail. Driven by the raging winds, the frozen sleet pounded incessantly against the shanty but it wasn’t like the drumming of a steady rain. Instead there were brief lulls until another huge gust of wind would toss the pellets about like marbles. The other three occupants of the hovel stirred at the sound of Knowles’ voice. If nothing else, it was a relief from the boredom of being cooped up inside until the storm finally blew itself out. The men had been trapped there in the North West Territories along the Liard River for three days. Their march to the 1898 Klondike gold rush suspended but far from over because as soon as the storm abated they would be on their way again. Such was their resolve. A year ago they had been part of a group of a dozen men that started out on foot for the fabled gold fields from Edmonton, Alberta but they were all that remained. The rest had given up, turned around and headed back home. They were all wrapped in robes, thick woolen caps and heavy boots to ward off the icy chill of the northern winter. They lay sprawled against the walls of the lean too and watched as Knowles’ eyes wildly moved about the hut and landed on each person in turn. He was tall and gaunt. His face was barely visible through his long, stringy hair that sprung from his fur cap. His thick, unkempt beard also obscured his features so that only his feverish eyes could be seen. They were black ovals tinged with red from the ordeal he was going through and they glittered as hard as the gold they sought. The first man they fell upon was the Frenchman, Francois Boisevert who everybody called Frenchie. From the depths of his robe that was pulled tight up to his chin and the same long hair and thick beard that hid his face, the man starred back at Knowles. Next to Knowles, Frenchie was the most experienced of the group. He had been a fur trapper and woodsman in northern Quebec for a few years before heading west to Edmonton. From that city he had made his way up into northern Alberta where he continued to trap furs while looking for gold. It was there he met Knowles who was trapping along the Peace River. He worried about the sudden outburst from his fellow KIondiker. At first he thought that maybe Knowles was the victim of the monotony and perils of trying to survive a winter in the far north. It took every bit of endurance, fortitude and experience a man had and sometime even that wasn’t enough because it could break the toughest of men. He’d known some men go stark, raving mad, while others just gave up and headed back to civilization. Then, because he knew Knowles and had never seen him back down from any challenge, he changed his mind. He thought it might be just plain old cabin fever that the Englishman was suffering from. He knew from experience that being cooped up in the tight confines of a miserable hut with almost nothing to eat and nothing to do for days could drive a wedge between even the best of friends. He’d even seen grown men who’d known each other for years suddenly become bitter enemies. There was one story he heard in which two brothers ended up fighting and almost killing one another. Then he finally decided it really didn’t matter because whatever Knowles’ beef was, it wasn’t with him. As far as he knew he had done nothing wrong, had committed no infraction to incur the Englishman’s wrath so he decided it was best to just wait and see what happened. He stared right back at Knowles, caught his wild, crazy eyes and held them. When Knowles’s eyes moved elsewhere, Frenchie shrugged his shoulders and wondered what the outcome of this little drama would be. They fell on Mike Ryan, the rookie of the foursome. The Irishman was huddled in the corner trying to keep warm and dreaming about Ireland. It was barely two years ago that he said goodbye to his family in preparation for his trip to North America. When he boarded the rusty old relic of a ship that took him to Toronto all he had was the clothes on his back and a few belongings stuffed in a bag. But he did have his dreams and hopes. He had been told about how the streets of the city were paved with gold and anybody with the willingness to work hard and a strong back could make a fortune. He had believed the stories too, thinking that within a year or two he would be back in Ireland with enough money to buy himself a farm. Instead, he met obstacle after obstacle and discovered that the stories of easy money just weren’t true. Within months he was so disillusioned he left Toronto and headed west where he was told the opportunities were much better. Ryan was slaving away at various jobs in Edmonton without much prospects of any of them going anywhere when news of the big strike along the Klondike River in the Yukon hit the area with a bang. Like thousands of other young men he got caught up in the gold fever. He was so excited he immediately quit his job and started making plans to go to Vancouver, British Columbia. From there, thousands of people were piling onto boats that would take them north along the coast and into Skagway, Alaska. They were told that from there they were within in spitting distance of the gold fields. All the frenzied gold seekers had to do was cross a couple of mountain ranges, which they would quickly learn were nearly impossible to climb. Then Ryan heard of a group who were going to go overland to the Yukon. He didn’t hesitate to join them and a few weeks later he was part of a12 men crew canoeing through northern Alberta and into the North West Territories. All of them were convinced that they would be picking gold nuggets out of the Klondike River by spring. Now, more than a year later, he was one of four men left. It was proof that what he lacked in experience, he made up for in fortitude and strength of will because he still hadn’t given up. He was still determined to reach the fabled gold fields. Since he didn’t exactly understand what was going on, Ryan sat up straight with his body tensed and ready for action. Under his robes he felt for his knife. He kept it sheathed but gripped it tightly just in case. If there was gonna be a fight he wanted to be ready. Outwardly he refused to show fear lest it make the men think he was guilty of something or worse yet, scared. He knew that these rough and tumble men wouldn’t take any guff from anybody. For them, to act afraid was to show cowardice, a trait they all despised. Any trace of that and he would lose their respect. Ryan felt relieved when Knowles blazing eyes left his and landed on the fourth man, Hans Norbert. The Swede was a huge, giant of man who stood even taller than the six foot Knowles. His body was also thicker and heavier but he had the same long, stringy hair and thick bushy heard. He stared back defiantly at the English man as if daring him to say something. Knowles seized the challenge and spoke again. “It’s you isn’t it?” He glared at Norbert. Now it wasn’t only his hard, unyielding fiery eyes that showed his anger. His body showed it too. It seemed to be quivering with rage, just like his knife had when he thrust it deep into the tree trunk. Knowles accusation made Frenchie and Ryan focus their attention on the Swede. They knew very little about him because he never talked much about himself. He had joined them in Edmonton and although not the friendliest person, nobody had complaints about him because up until today he had always pulled his share. But now, although he wasn’t admitting to the horrible deed, his head hung low and he barely managed to look them in the eye. He wasn’t denying it either but his body posture spoke the truth. One look told the pair that Knowles was right. Norbert was guilty as hell. Frenchie looked at him with disgust for a full moment before speaking. Ryan stayed silent because he didn’t know what to say. He lacked experience in these matters because he’d only been a year tramping through the wilderness while men like Knowles and Frenchie had been doing it for many years. But he did know one thing for certain. Norbert wasn’t much of a man if he wouldn’t share the rabbit. Small as the hare was it would have been a great addition to the pot that hung over the open pit fire. All it contained now was bits of flour and winter berries. A couple of days ago it also had a few bits of meat floating in it but those were long gone. Under ordinary circumstances it would have been easy enough to replenish it with some fresh game but the cursed winter storm had kept them inside for three days. Maybe in the morning it would let up but if it didn’t they’d be stuck in the hut and unable to hunt for another day. “You understand what this means, don’t you, Norbert? Knowles spoke again. When the Swede still refused to say anything, Knowles explained it. Knowles took his angry eyes off Norbert long enough to see if the Irishman and the Frenchman were in agreement with him. “You’d better believe it. I don’t want no more part of him,” Frenchie quickly spat out. He put his words to action by immediately grabbing his bed roll and bag of possessions and moving as far away from the Swede as he could. Ryan nodded in agreement and quickly grabbed his meager possessions and moved over by Frenchie. Knowles promptly turned his back on the Swede and did the same. He shoved his bedroll beside Ryan’s so that the trio took up one whole side of the little hut. This left Norbert all by himself against the other wall. Although only a few feet separated them, it could’ve have been a chasm the size of the Grand Canyon. For the rest of the night Knowles, Ryan and Frenchie talked quietly among themselves but they refused to look at Norbert. It was if he wasn’t even there. They also shared a couple of cups of what was left of the communal food pot but nobody offered Norbert the smallest taste. He was so ignored it was as if he were one hundred miles away. They didn’t even look at him. As far as they were concerned he no longer existed. When the men woke up the next morning they were met with dead silence. It was eerie. After three days the blizzard had moved on sometime during the night. There were no more wild, violent gusts of wind threatening to blow away their hut. The pounding of snow pellets was also gone. He completely ignored Norbert who still sat by himself against one wall of the hut. The Swede in turn never said a word to explain or justify his actions. He just silently watched the trio gather up their meager possessions but his blank eyes followed their every move. To Ryan it seemed as if Norbert was actually accusing them of some crime, like it was somehow their fault. The Swede remained inside the shelter while the trio stumbled outside. They were greeted by bright sunlight but bitterly cold temperatures. The storm had passed by alright but now it felt as if the temperature had plummeted down to impossible depths. “Damn, it must be a least 40 below out here, maybe even colder,” grumbled Frenchie as they tramped about in circles, trying to loosen cramped limbs and get the blood flowing in their half frozen, half-starved bodies. The frigid air made them gasp when they breathed and their breaths froze instantly leaving vast clouds vapor, like a steam engine. In addition, the frigid conditions made everything so brittle there was a loud snap, crackle and pop with every step they took. There was also a loud crunching as their boots hit the layers of frozen snow pellets. It made it sound as if they were walking on gravel. Ryan said nothing. He was too busy getting into his snow shoes and adjusting the pack he would carry over his shoulder. As soon as everybody was ready, they set off. As usual they were led by Knowles who set a pretty fast pace. Right behind him was Frenchie and then Ryan. He took one final look back at the hut that had been their home for three days and saw Norbert. He had just come out of the ram shackled hovel and was silently staring at them. There were still no signs or words of explanation as he watched them disappear from sight and abandon him. The trio hiked for hours that day. Despite the gnawing hunger in their stomachs they pushed themselves onward as fast as they could. Driven by their thirst for gold and the need to find something to eat, they only stopped a couple of times. Each one was just long enough to heat the thin gruel in their cooking pot. Also, it looked as if Knowles prediction had been right. The whole wintery landscape was totally barren and devoid of any creatures. Any animals worth killing for food had fled during the blizzard. Whenever they took the brief rests Ryan would look back and spot Norbert. He was following their tracks but always lagging about 50 yards behind. It made it obvious that he was no longer part of the group, but an individual, all on his own. To anyone who didn’t understand what had happened, it looked as if he were stalking them rather than being left behind. “Don’t worry about him Ryan. It’s not our fault. He made his own decision and decided not to share with us. Now he’s on his own so he’s no longer a concern to us.” Frenchie advised when he saw the Irishman occasionally look back as if checking on Norbert’s progress. But Ryan couldn’t help himself. He kept thinking about how long the Swede would last with only the remnants of the rabbit to eat and nobody coming to his aide. It made him wonder how a person could sink to such lows that he would deliberately refuse to share, even when it mean back stabbing his friends and putting his own life in peril. They took turns leading. After Knowles got tired of setting the pace, he stepped aside, waited for Frenchie to pass him and take the lead. That put Ryan in second place and Knowles fell in behind him. When Frenchie go tired it was Ryan’s turn to break trail until Knowles regained some strength and took the lead again. At the end of the first day on the march they got lucky. It was late in the afternoon with the sun sinking fast. The trio had walked all day with nothing to eat except for the thin gruel. When they arrived at a creek it was frozen fast like everything else in the area but as they trekked along it looking for a good place to stop for the night, they could hear an occasional gurgle. It meant deep down under the ice the stream was still running fast. Frenchie was the first to notice it. He suddenly called for a halt. Knowles and Ryan huddled around him, wondering what the Frenchman was up to. He was staring down into the ice covered stream and pointed. “You know what?” He jumped and shouted in such excitement that the pair thought he found gold. They were wrong, but they quickly realized it was something even better considering their present starving situation. “I think there might be some fish in there. I bet they’re still running underneath the ice,” he exclaimed excitedly. Knowles and Ryan watched as Frenchie slowly walked forward until he came to the spot where a piece of land jutted out into the creek like a small peninsula. He pointed down again. Evan as he spoke, Frenchie was digging into his bag for a coil of thin wire. Within in minutes he had it unrolled and was attaching a crude hook do it. Knowles and Ryan watched in anticipation as he grabbed his hatchet to smash a big hole in the ice then drop the line in. They didn’t have long to wait. Five minutes of dangling the makeshift fishing line into the eddy netted him the first fish. With a loud whoop and cheer he pulled it out, unhooked it from his line and handed it to Knowles. The Englishmen eagerly grabbed it and had his knife out before he reached a suitable spot to gut it and clean it. Frenchie immediately dropped his line into the creek again and within minutes snagged another one. He handed it to Ryan who gave it to Knowles to clean and gut. The other two fish took longer to land but the men didn’t care. Knowles was cleaning and laying out strips of the fish in their fry pan as fast as Frenchie caught them. By the time they sat down on some fallen trees to eat they were so excited and happy they felt as if they had actually found gold. Still, the men were prudent and mindful of how scarce game was so they only ate three of the fish. It didn’t fill their hungry bellies but it was enough to keep them going for another day. The fourth fish was carefully stowed away in a bag. It would be shared by all three of them if they failed to find more to eat tomorrow. The meal finished the men lay back in their robes. From Ryan’s position he could see Nobert through the fast darkening sky. He sat crouched in the snow at the usual 50 yards back. He looked so much like a lone, hungry feral animal that he was tempted to offer him a piece of fish but Frenchie and Knowles seemed to be reading his mind. “Leave him be Ryan. He’s committed a cardinal sin so he’s no longer one of us. We don’t care what happens to him,” Frenchie stated. After the speeches there was total silence around the make shift camp except for the crackle of the fire and the occasional snap of a limb breaking in the bitter cold. It gave Ryan time to think. He knew they were right. Even though it seemed like such a harsh punishment, Norbert couldn’t be trusted and a trust was everything. “Yeah, okay, I get you. Norbert’s just no good so I guess he deserves what’s he’s getting. So I’ll stick with you guys,” Ryan announced. “Wise choice, Ryan.” Knowles stated while Frenchie acknowledged his decision with another grunt. With that the men snuggled down into their bedroll for the night. It was such a clear night Ryan watched the full moon and the Northern Lights play games across the sky for a while before he drifted off to sleep. The men were stirring at the first sign of dawn breaking over the horizon. In the icy morning filled with hoar frost and the sound of snow crunching under their boots, they hoisted their bedrolls on their shoulders and continued their trek to the Klondike. This time Ryan only looked back at Norbert once. He could barely see him in the early morning light. Then he shrugged his shoulders and put him out of his mind. By noon with no sign of game and their bellies empty, they stopped long enough to cook the remaining fish. It barely touched their gnawing hunger but no one complained. By the time they finished eating their meager meal the weather had changed again. It had warmed up a few degrees and snow begun falling. It was so heavy it silently dropped around them like they were being wrapped in a thick white blanket. The men ignored it. They just kept plodding northward until Knowles called for a halt. He pointed to a clump of bushes that were off the trail and several yards ahead of them. Although Ryan strained his eyes trying to spot what his companions were looking at, he saw nothing. “We got a bit of ammo left so I say let’s use a couple of bullets and get us a couple,” Knowles announced. As soon as he readied his gun he motioned for Ryan to keep quiet and stay behind. Then he and Frenchie stepped off the trail and silently approached the bushes. Knowles quickly circled around so that he and Frenchie crept up on the birds from two different directions. Although their communication was silent, they acted as one. Frenchie waited until Knowles, had snuck right up on the birds. He waited until the Englishman took a couple of quick shots right into the flock. All but two of the birds rose in a wild flutter of wings. Those were the two Knowles had downed with his two shots. At the same time Frenchie waded into the startled grouse with a big stick. He swung at one baseball style that was half running, half flying as it skimmed about two feet off the ground. The lucky strike nailed the fleeing bird and knocked it to the ground. Before it could move Frenchie was on it and finished it off by grabbing it by the neck and twisting it. That night the men dined on the grouse. It finally satiated their hunger, at least for the time being and they all agreed it was most delicious food they’d eaten in days. Ryan barely thought about Norbert. Again, he only looked back once but couldn’t see more than a few feet through the heavily falling snow so he gave up. Besides, he now felt like Knowles and Frenchie. The big Swede was no longer his concern. When they woke in the morning, the snow had stopped but there was at least a foot of it to contend with. The trio only took the time to finish off one of their birds before they were off. 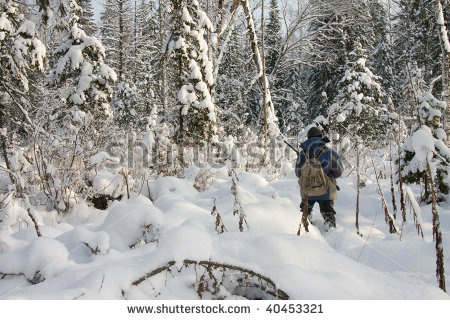 Again they walked all day, mostly along a big, wide Laird River because the snowfall had erased all signs of a trail. This time Ryan was leading when he stopped. “What’s up?” whispered Frenchie, his eyes following Ryan’s until they found what he was pointing at. “Deer, at least a couple of them in the bushes up ahead. Must be sheltering themselves from the snow in there.” Ryan explained. “Just stay quiet, they’re close enough for a shot so let’s not spook them,” Knowles warned. He began pulling his rifle out of his pack when he hesitated and looked at Ryan. “You got any bullets left for yours?” He asked the Irishman who nodded. “A few but not many,” Ryan replied without taking his eyes off the deer. “Well then, since you spotted them first, it’s your honors so go for it if you think you can bag one. But don’t miss, remember how badly we need that meat,” Knowles announced and then glanced at Frenchie who nodded his agreement. At first Ryan was shocked at the Englishman’s words. Usually Knowles and Frenchie, due to their experience, made all the decisions and at crucial times like this, one of them would be pulling the trigger to make sure they got themselves a deer. Ryan understood that and always deferred to their leadership, but he sensed now things were different. It was as if they were offering him a chance to prove himself. He realized that if he passed the test the relationship would change. He would be a full partner instead of the junior member who tagged along in their wake. Was he up for the challenge? Hell yes,” Ryan thought as he brought his rifle up to his shoulders. At first his hands shook but he willed them to be steady by taking several deep breathes to relax. Then he aimed his gun right at the heart of the closest animal. Took another deep breath and pulled the trigger. The shot startled the deer that began to quickly race away. It made Ryan think he had missed completely. What a catastrophe that would be, but then Frenchie and Knowles were slapping him on the back. “Congratulations, you got it dead centre.” Frenchie stated. “Yup, dropped it like a stone,” Knowles agreed. Ryan beamed with pride as he sensed the new respect the men were giving him. He wanted to say something but his companions were already striding towards the downed animal. That night they slept with full stomachs and Ryan felt something else as he slept beneath the stars. He had passed the test. He was one of them now, an equal. In the morning as they packed up their meat, secure in the knowledge they had enough to eat for days, Knowles, Frenchie and Ryan continued their trek to the god rush. As Ryan looked back down their trail one final time, there was no sign of Norbert, not that he cared. He had better things to think about, like finding gold nuggets along the Klondike River.